Japan is engaging in China’s BRI while also hedging its bets through similar initiatives with other partners. There is an old saying: Keep your friends close and your enemies closer. Japan seems to be well aware of this adage, because it is oscillating between fellow democracies and China in order to strengthen its position in the race for influence in Asia. Japan used to be one of the most vehement critics of the Belt and Road Initiative, together with the United States, but lately its stance on the BRI seems to be changing. In the first years after Shinzo Abe became Japan’s prime minister in 2012, relations between China and Japan were quite cool. China’s President Xi Jinping and Abe met many times, but only in short, informal settings. It took six years for one of the two leaders to finally secure an official visit to the other country, with Abe’s recent visit to China. Since 2014, the relations between the two countries have started to improve, especially in recent months, when China has become more and more affected by the trade war with the United States, while Japan has itself been the target of steel and aluminum tariffs. The trade war convinced China to reconsider its relations with Japan in order to balance the economic losses in its relations with the United States. Japan took advantage of this and tried to do its best to establish friendlier relations with China. And the results are literally visible on the two leaders’ faces. If, in 2014, Xi didn’t look very happy to meet Abe at the Asia-Pacific Economic Cooperation forum (APEC), things had changed by the 2018 Eastern Economic Forum, held in September in Vladivostok. Not only did Xi look happier to meet Abe, but they decided to schedule an official meeting in Beijing, a landmark visit that Abe undertook in late October. The improved relations between China and Japan aren’t limited to politics, but also extend to the economic level, with Japan joining China in developing infrastructure projects in Asia. 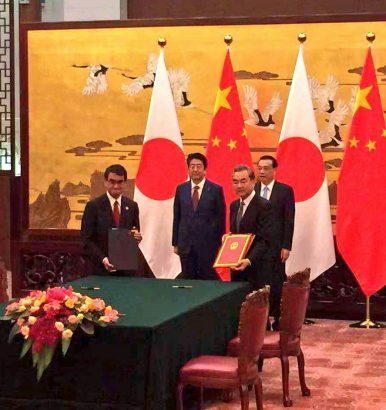 “If you can’t beat them, join them” seems to be Abe’s newest motto, and he oversaw the signing of 500 business deals and a $30 billion currency swap agreement while in China. Japan’s renewed interest in China contrasts with the steady attention Japan has focused on Asia. Japan is very interested in investing in infrastructure in Asia, especially through the Asian Development Bank, and it decided to team up with China in order to reduce the competition between the two. Thailand’s railway project may be the first candidate for a China-Japan collaboration. The envisioned high-speed railway will connect Thailand’s three main airports: Don Muang, Suvarnabhumi, and U-Tapao. In the future it may become a link for the Pan-Asia railway network, a high-speed railway that aims to connect Kunming in China with Singapore. The project is expected to cost over $45 billion and Japan and China want to form a committee to take part in the auction. Indonesia and its Jakarta-Bandung railway project is the best example of the competition between the two countries that they now want to avoid. In 2015, bidding against Japan, China was selected to construct the Jakarta-Bandung railway section, while Japan was to upgrade the railway that connects Jakarta with Surabaya. Then in 2017, at India’s invitation, Japan agreed to develop the Asia-Africa Growth Corridor (AAGC), a maritime route that would be the rival of China’s 21st Century Maritime Silk Road. Pledging to be an environmental friendly project, the AAGC plans to connect ports in Jamnagar (Gujarat, India) with Djibouti; the ports of Mombasa and Zanzibar with ports near Madurai (Tamil Nadu, India); and the port of Kolkata to that of Sittwe in Myanmar. The AAGC also seems to be a doppelgänger of the “String of Pearls,” which is an American-coined concept referring to China’s strategy to build ports along the Indian Ocean coast. Apart for focusing on the Indian Ocean, the AAGC’s goals are also “to build robust institutional, industrial and transport infrastructure in growth poles among countries in Asia and Africa” with the main purpose being to integrate Asia and Africa into the Japanese-Indian bloc. Japan’s interest in infrastructure in Asia can be seen not only through the Partnership for Quality Infrastructure and the AAGC, but also through the trilateral partnership that it signed with Australia and the United States in order to invest in infrastructure in Asia. The trilateral partnership aims to spread peace in the Indo-Pacific region and to achieve that aim, the main investments will be focused on energy, transportation, tourism, and technology infrastructure. Together with the Asia-Africa Growth Corridor, the trilateral partnership wants to counter China’s presence in the Indo-Pacific region and to increase Japan’s influence in the region. As a result, Africa and the Indian Ocean became important focus points of Japan’s foreign policy. By signaling its interest in cooperation with China, Japan has diversified its approaches to infrastructure in Asia, Africa, and the Indo-Pacific region. Abe’s interest to position Japan as a node in the region is exemplified by his recent meetings with both Xi Jinping and Indian Prime Minister Narendra Modi, which took place in less than a week. Japan is no longer working just to counter China’s Belt and Road, but to increase its presence in the infrastructure development sector, willing to partner with any country. Although Japan is now both competing against and collaborating with China and its BRI, the steps that Shinzo Abe has taken may bring peace into the region and may enable Japan to strengthen its presence in the Asia-Pacific region. Andreea Brînză is Vice President of The Romanian Institute for the Study of the Asia-Pacific (RISAP). Her research focuses on the geopolitics and geoeconomics of China and especially on the Belt and Road Initiative. Chinese and Japanese infrastructure initiatives should not be viewed as out-and-out rivals.